No one wants to live in the dark, but those beautiful, bright windows also let the sun beat into your home and allow cool air to escape. 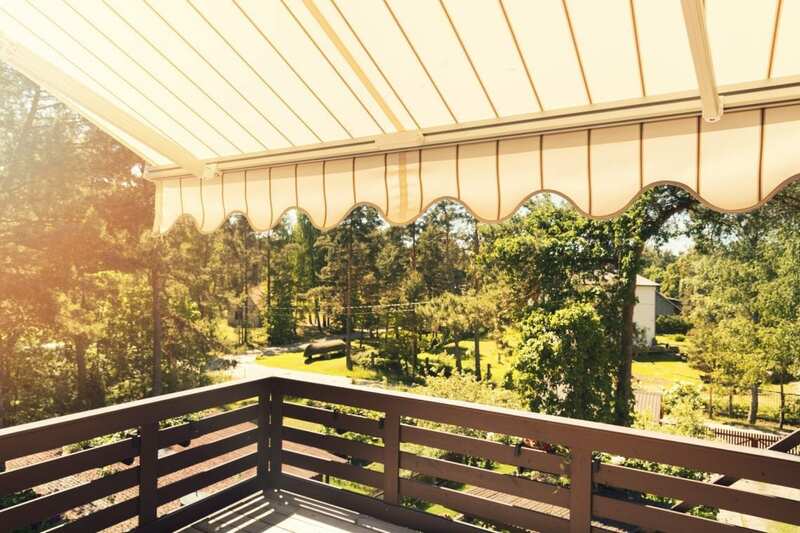 When you live in a hot, arid region, providing shade can cut costs associated with air-conditioning, whether you create it with awnings or roll-up shades or landscape elements. While interior blinds do prevent some of the sun’s oppressive heat from reaching the inside, it’s even better to have an exterior shade that keeps the sun’s rays from reaching the glass at all. And unlike air conditioning, the initial investment is your primary cost. Solid aluminum is a workhorse that won’t let the sun barrage your windows. And “fixed” means just what you would think: this awning stays in place year-round, an advantage for anyone who prefers not to do a lot of upkeep. The disadvantage to this choice is that aluminum awnings don’t suit lots of contemporary homes. They’re considered as a 70s vintage look and can oppress the view of your home from the road or the water. While you may feel like you’re at war with the sun, Bahama shades can keep you from feeling like you’re in a bunker. They are louvered shutters that can be arched and anywhere from single- to quad-pane. The shades tilt towards the sky, with side arms and a piano hinge track along the top to hold them at a 30-degree angle. While they can’t be flipped all the way up to allow lots of light in, you can raise Bahama shades to a horizontal position that lets you see outside. They’re also a top choice for homeowners who want to easily self-install, or who have windows that need protection from flying debris when hurricanes strike. Several models of exterior shades roll so they’re not always visible. They are a good alternative for part-time residents, areas with seasonal weather and home designs that can’t sustain a permanent awning or Bahama shade. Fabric awnings retract into a tube above the window when they’re not covering the window. They can be quite stylish, but the fabric does deteriorate in harsh climates. Rolling shutters completely cover each window with a metal gate and block sunlight completely when they’re in place. You may have seen them covering business windows. They’re great for privacy and security, but the look can be harsh in residential areas. If you can’t justify the outlay for exterior shades that fit with your current home’s design, avoid the need for exterior shades next time you buy or rent. When you’re living in an area like Florida where the sun is incessant, the best option is to pick a place with just a few windows or windows that don’t face the sun. You can also remodel your current place or a future purchase with a cooling landscape.